I just got back from a whirlwind week’s holiday in Manila which is why I haven’t posted much recently. On my first evening out on the town, good friend Therese who just moved back home in October, picked me up for dinner. We had a hard time choosing where to go as there are so many restaurants – new and old, that I wanted to go to. Since we had to be close enough to home in case the kids freaked out while I was having dinner, we narrowed down our choices to the Makati area and ended up at People’s Palace. People’s Palace originally opened in Malate, an area located in old Manila in the late nineties. Colin Mackay, the Scottish proprietor of the modern fine dining Sala restaurant decided to open a Thai restaurant as well. 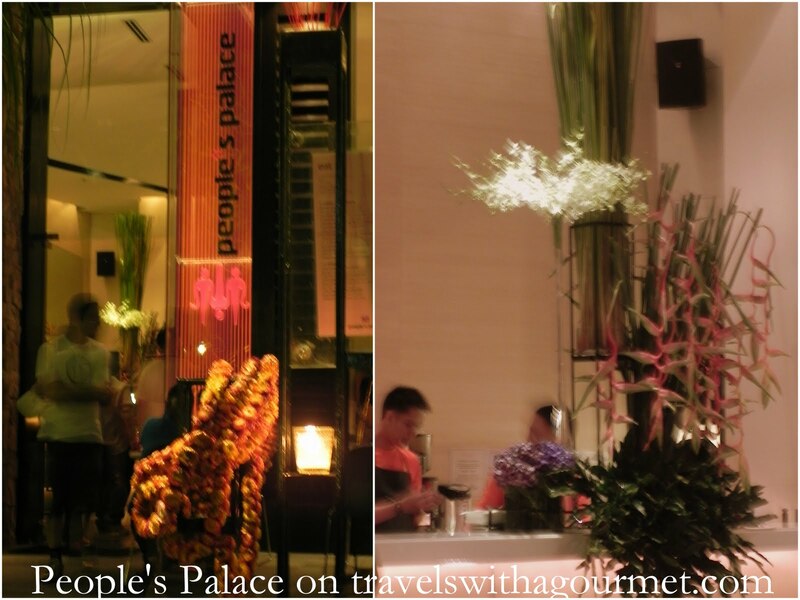 In 2005, when Greenbelt started it’s extensive renovations to make it the cosmopolitan city center it is today, People’s Palace moved to Makati and opened the more casual Sala Bistro alongside it. Sala Restaurant also moved to Makati and is now at the Locsin building, otherwise known as the PLDT tower moving Colin’s restaurant empire from Malate to Makati. Since opening, People’s Palace has been packed with both locals and foreigners out for a taste of authentic Thai in Manila which was not always that easy to find. I contacted Colin to let him know I was in town but he was just about to leave for Istanbul so I missed him on this trip. Therese and I arrived early for our booking and were led to an outdoor table to wait while they were setting up our window side seats. The place was packed even if it was a Monday evening. Luckily, we didn’t even have time for a drink and our table was ready. It took us a while to go through the menu and decide what to order as there were so many dishes we wanted to try and since we were only two, we had to limit ourselves to one starter and two main courses. We settled on crispy catfish with green mango salad as our appetizer then the stir-fried prawns with chili, peppercorns and holy basil plus a light red curry of bean curd, pumpkin and mushroom. To drink I chose a fruit smoothie of mango and pineapple and Therese had the salty lime soda fizzy – both perfect for that humid evening. We started out with the catfish salad was deep-fried shredded catfish and sour green mango strips tossed in a sweet, salty and spicy dressing. 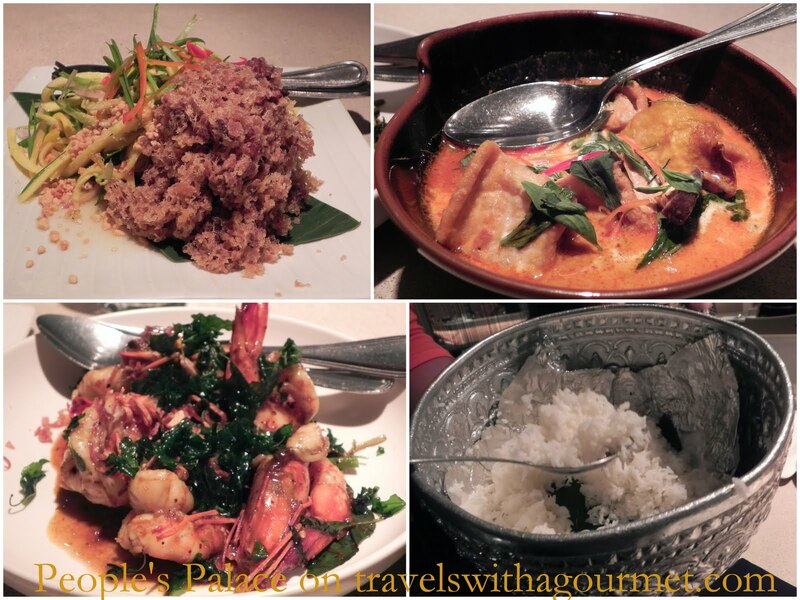 It was the perfect melange of Thai cuisine’s signature flavors of spicy, sour, salty and sweet. We took our time with the first course and filled each other in on what we had been up to since October of last year. (When Therese used to live in Spain, she in Madrid and I in Marbella, we would speak on the phone every single day so nine months apart meant a lot of stuff to catch upon). We cleaned out that plate and eagerly awaited our main courses. Lots of times, restaurants have fantastic and imaginative starters but mediocre main courses. Not so at People’s Palace. They were both delicious: fried bean curd, mushrooms, pumpkin chunks and basil in a creamy red curry sauce while the stir-fried prawns were again both spicy and sweet and complemented by the shredded crisp holy basil. Steamed rice was served a volonte, a.k.a. eat-all-you-can (doesn’t it sound so much lovelier in French?) from large hammered tin bowls just like those I’ve seen all over Bali. 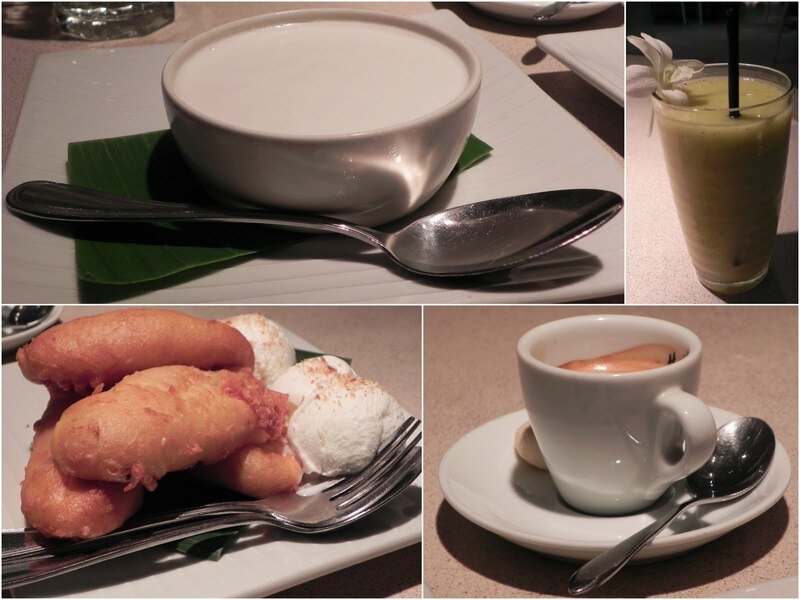 We finished our dinner with two desserts – we really only wanted to share one but decided on two for the blogs sake. Two coconut-based desserts: crispy bananas with coconut ice cream topped with crispy coconut and the Thai tako tapioca pudding with thick coconut cream. The bananas were the typical fried bananas except that when combined with the coconut ice cream and toasted coconut, it was a delightful mouthful of hot, cold and crunchy coconut. The Thai pudding was more traditional – a thick layer of coconut cream hiding a bowlful of mini tapioca – similar to Gula Melaka. We would have lingered over our post-dessert espressos but I got a call from my mom saying I better get home soon as the toddler had woken up and was screeching for mom. Therese treated me to dinner then sped me back home. Dinner was short but delicious. In fact, I’m still dreaming of my dinner there and wish that I had gone back a few more times before coming back to Bali. Wow! I should say, It is very delicious Post. I like to eat all dish which you have mentioned in you post. Please share more like this.